It was a wild season with a lot of ups, downs, and sideways for all the Cape teams. However, some individuals had a great 2018 Cape League campaign. Through 41 games this season, Elon’s Michael Barefoot hit an eye-opening .379 for the Hyannis Hawks. This was good enough to win the league’s batting title. Florida International’s Austin Shenton had an incredible year for Wareham, hitting .349 in 44 games with 9 doubles, 4 home runs, and 30 RBI while working 25 walks. He also had the most hits in the league with 52 hits, one more than Cotuit’s Jonathan Robertson. Murray State’s Davis Sims for Falmouth and Tennessee Tech’s Nicholas Osborne for Orleans tied for most home runs on the season with 8. UNC-Wilmington’s Greg Jones led the league in stolen bases, swiping 20 bags on the season. We saw a lot of good defense on the Cape this summer, too. Duke’s Adam Laskey went 5-0 with a 1.18 ERA and 26 strikeouts in 6 games, 5 of them starts. His 5 wins were the most in the entire league. West Virginia’s Alek Manoah led the league in strikeouts, recording 48 in 33.1 innings of work for Chatham. He ended the season 3-2 with a 2.70 ERA. Bourne’s Jacob Wallace of UCONN appeared in 12 games and posted an ERA of 0.00. In 13.2 innings pitched, he struck out 25 batters and walked 5, allowing just 10 hits and recording 6 saves on the year. 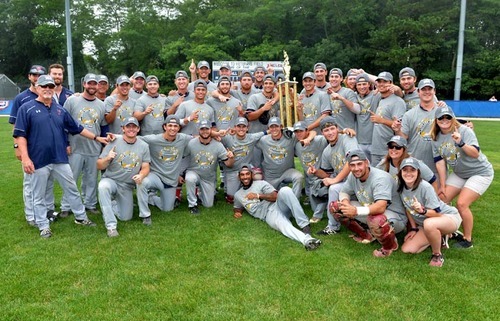 The Wareham Gatemen took home the title for 2018, winning 6 straight games to sweep the playoffs and going home Cape Cod League Champions. They finished the regular season at 25-17-2, going 5-4-1 in their last 10, losing their last game of the season. But, not before they earned the number one seed in the playoffs. California Berkeley’s Andrew Vaughn led the team with 5 home runs, despite playing in just 14 games. Austin Shenton was outstanding in the league’s talent pool, and led the Gatemen in average, doubles, walks with 25 free passes, and hits with 52. Jeremy Ydens produced the most runs with 34 RBI which was the most in the league. USC’s Connor Lunn went 3-1, good for most wins on the team, and posted a 2.28 ERA in 5 appearances, 3 of them starts. Vaughn’s Cal Berkeley teammate Jared Horn struckout the most opposing hitters with 36 in 28.1 innings. We got to see some incredible individual and team efforts this summer that was accompanied by great support from the local and travelling Cape League fans. We wish the best of luck to all the players that played in the CCBL this summer, again proving that this is where the stars of tomorrow shine tonight. See you next year!